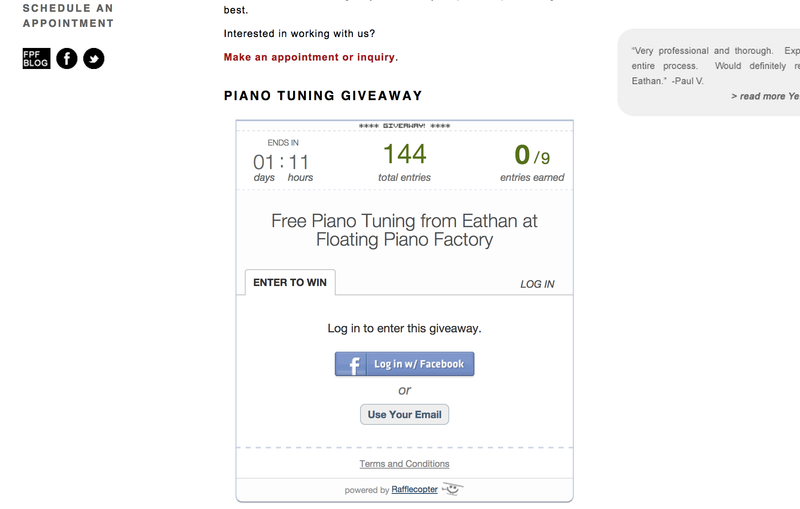 ← Win a Free Piano Tuning from Floating Piano Factory! This post contains a video, detailed instructions and images illustrating how to enter a giveaway on our site. 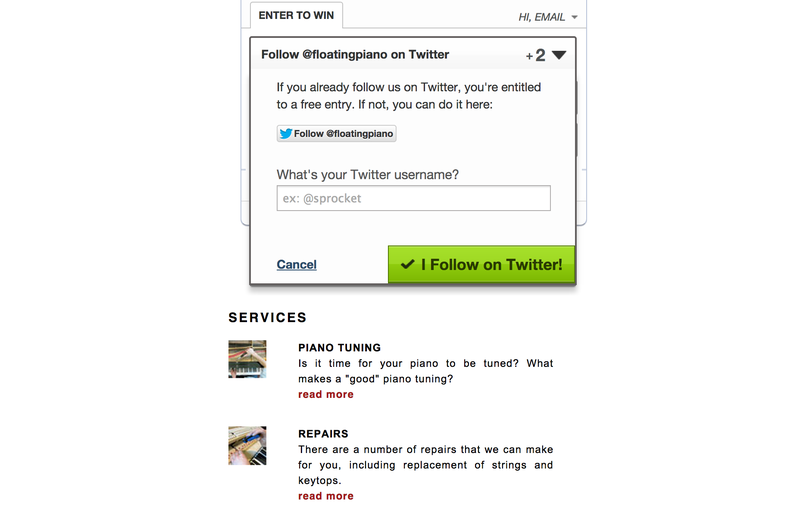 If you have any questions at all feel free to email us: contact@floatingpiano.com. The video below shows how to verify various types of entry using the raffle widget on our homepage. Scroll further for explanations in images and text. 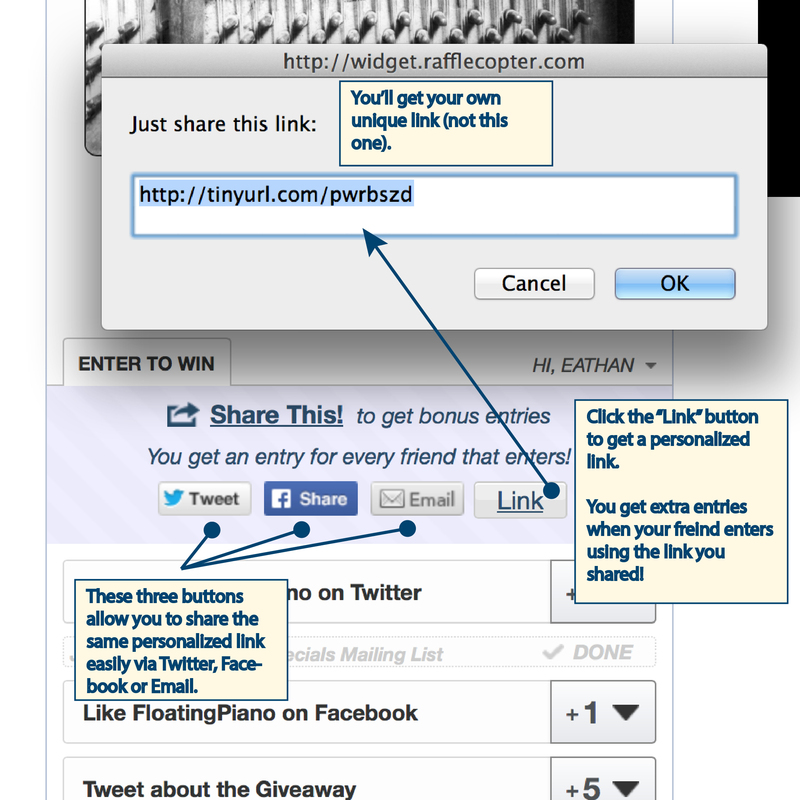 If you go to our homepage and scroll down there should be a rafflecopter widget. After you login, it allows you to paste web address code that verifies that you have tweeted, liked, or followed. As an example, to tweet about the giveaway click the button that says “tweet”, post the pre-filled tweet, then follow the instructions on how to find the tweet URL of your tweet and paste it in the appropriate box. Then click “I tweeted”. The screenshot attached below shows what the widget looks like before you log in. See the following screenshots for more details on each type of entry. To start entering just go to our homepage. Here’s how things look after you login and just before you complete your entry for tweeting. Click the button that says “tweet”, post the pre-filled tweet, then follow the instructions on how to find the tweet URL of your tweet and paste it in the appropriate box. Finally click “I tweeted”. 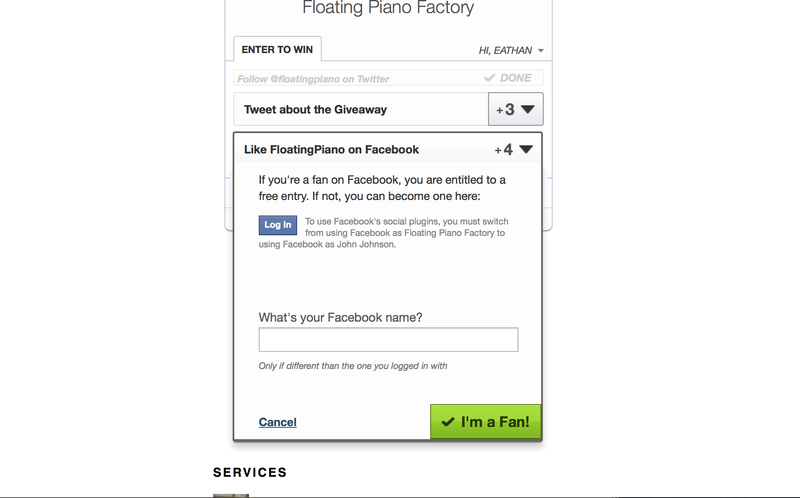 To enter by liking on Facebook, just like FloatingPianoFactory on Facebook (there’s a link for doing that in the widget) and then paste your Facebook name into the widget. 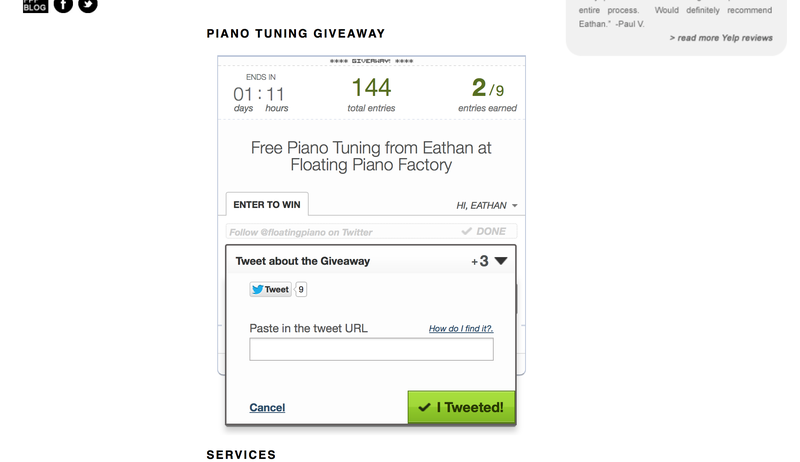 To enter by following on twitter, just follow @FloatingPiano on Twitter, then paste your twitter handle into the widget. Once you have entered via one of the initial options you are allowed to gain additional special entries via sharing a link with others! Click one of the four buttons listed under the purple “share this” section. The fourth button allows you to simply get the special link that the other buttons include in posts via twitter and Facebook. You can email that link to a friend or post it wherever you like. The link is unique and loads the Rafflecopter widget with your identifying info so that the person who enters gives you a point when they do!